It was September, I’d just dropped a buck in a river bottom and temperatures were hot. Frost had not yet hit the country I was hunting, and the bugs were thick. In the moist surroundings where I was left to skin, cape and bone-out the buck, mosquitoes were particularly bad. I knew right away they’d make my time miserable, so I grabbed my ThermaCell, turned it on and let it start to burn—then I went to work on the deer. In just a few minutes the almost unbearable mosquito hatch was under control, and I went about my business without losing any more blood. For nearly a decade I’ve been using the ThermaCell. In fact, when this device first made its way into the outdoor industry, I was one of the first to field-test it. And what better place to test it than in Alaska, where mosquitoes are considered by many to be the state bird. Over the course of the first year, I tested the ThermaCell in many parts of Alaska, on salmon fishing trips, bear hunts and more. I had it in some of the most mosquito-laden parts of the state, where the pesky insects buzz so loudly, it’s nearly impossible to hear yourself speak. The worst places I’ve seen for mosquitoes are the jungles of Indonesia, the swamps of Australia and much of Alaska. While the ThermaCell wasn’t out during my last trips to Australia and Southeast Asia, I’ve taken it to many parts of Alaska. What I learned on those early test missions was that the ThermaCell worked, and worked well. If there was one mosquito around, it would find me. My wife says it’s because I’m so sweet! But, the truth is many of my hunting, fishing and camping trips over the past 40 years have been miserable due to pesky mosquitoes. The very first time I fired-up a ThermaCell on Alaska’s Nushagak River, the impenetrable wall of mosquitoes and white sox not only left me alone, but also stayed away from the four other people in our boat. We were fishing out of a 24-foot sled boat. To rid biting bugs of that much area seemed impossible to me, but it worked. I know I kept turning the unit off and on to make sure it was the ThermaCell keeping the bugs away and not something else. Every time I turned the unit on, the bugs would leave. Switched off, they’d return. Why do I relate this fishing story in a whitetail magazine? Because if you can control biting bugs in the country’s most infested lands, then it’s sure to work elsewhere, including habitats occupied by whitetails. Over the years, I’ve used the ThermaCell when scouting for deer in late spring and early summer, and while hunting them in the months of August, September and October. Since using the ThermaCell, I’ve gotten away from bug repellents in the form of oils, sprays and wipes. The upgraded holster for the ThermaCell comes with a nifty clip that easily fastens to any pack, ground blind or surrounding brush. When field dressing game, I’ll place the unit directly on the carcass, moving it around as needed to keep bugs away. Back at camp I’ll use the ThermaCell Lantern. This device works just like the original unit, but also offers the luxury of light, just like a lantern. I’ve spent many hours back at camp, caping and cutting up deer under the aid of the lantern. The ThermaCell works off a butane cartridge, which heats a hot-plate that slowly burns a mat. The mat contains a repellent which emits a synthetic odor that actually mimics an insecticide found to naturally occur in certain types of chrysanthemum flowers. The repellent’s odor does not spook game that I’ve ever witnessed, and I’ve taken over 100 big game animals around the world while wearing the ThermaCell. If I thought it spooked game, I wouldn’t wear it. There is an earth scent mat option for those skeptics. Each ThermaCell unit comes with one butane cartridge and three mats, offering up to 12 hours of protection. When winds come up or you’re on the move, turn off the unit. Be sure to have extra cartridges and mats along, in case you run out of either, you’ll quickly see how effective this device is. One of the things I love most about the ThermaCell is that I no longer need spray or lotion repellents. On those warm days, the chemicals in many body-applied repellents may actually enhance a sun burn. Others create strong odors. There’s nothing worse than sweating all day, being covered with bug spray, then crawling into a sleeping bag all sticky and smelly. With the ThermaCell, there are no such worries. From Alaska through Canada and around the continental United States—especially the West—I’ve used the ThermaCell in many places, on literally hundreds of hunts. When it comes to controlling mosquitoes, no-see-ums and black flies (white sox), there’s nothing I’ve found that is as effective as the ThermaCell. 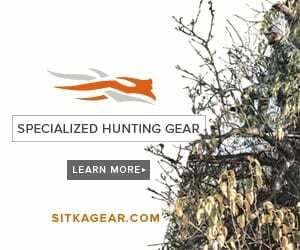 There’s a reason I keep using it, and you can bet I’ll always have one on-hand when hunting whitetails–or any other game–where ever there are biting insects.